This week has been a bit of a lift in terms of generosity. Generosity of deed, spirit and word. We were very grateful to receive a cheque for £750 from the proceeds of the Green Door Artists auction. The Green Door Artists are a fabulous group of local artists with varied styles and work. We held their annual auction at our Unit earlier in the year and despite a major road snarl up with the M6 being closed the event raised a good sum of money. When you think that S2C’s current yearly spend is about £20,000 then you will realise how significant a chunk this is for us. A big thank you to all the artists who contributed artwork. Another generous (and brave) act followed on with one of our Trustees, Julie Thomas, taking part in the Great North Swim across Lake Windermere on June 9th. I don’t know if any of you have tried open water swimming across a deep lake like Windermere but the temperature is chilly and with a wetsuit to keep warm it makes swimming and breathing more difficult. Julie is doing this to raise funds for Space2Create. 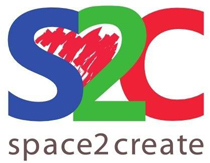 Julie has sponsorship forms and there is one at S2C too or you can simply make a donation to S2C. Look out for the Donate button on our Facebook page or website. This takes you to the Charity Checkout S2C page where you can choose the amount to donate and method of paying securely. Leave a message for Julie too! Or simple email, text or message S2C and say the amount you would like to sponsor Julie and contact details. S2C often gets people referred form their GP to come along to our sessions. Until this week I had very little feedback from the GP’s about what they thought or the feedback they received so it was very good to have opportunity to speak to three local GP’s from different practices who gave us some lovely and very positive feedback about the positive impact attending sessions had for the patients they referred. It is always good to hear how the work we do helps people and even more so when it comes from the medical professionals we link to. My final word on kind acts has to be to our small volunteer team who keep S2C running. There are never enough! But they do everything from the cleaning to the accounts, for a couple of hours or over a few days. We are always in need of volunteers. It is sometimes hard to work out a role for a new volunteer. That’s sounds daft but when you have several volunteers doing multiple jobs it can be hard to split things away. So if you do want to help make a difference in your community, no matter how big and small a role you can do, come and talk to us. We can find out the best way you can help us and often we find that volunteering helps the volunteer too. Some people volunteer to give something back, some because they feel isolated, some because they have a passionate belief about a cause, some to help them with their studies or a temporary chance to gain experience before they find a job. Many reasons to volunteer. If you are thinking of volunteering or know somebody who is then why not head to Kendal Town Hall on Wednesday 6th June 12-1.30pm. S2C volunteers and those from many other charities will be there at the CVS Volunteer Fair. So, now you are wondering how I’m going to fit the Cornetto’s into this. Like any good drama, keep the suspense building till the end finally reveal that I enjoyed one in the garden with my dog in the lovely hot weather we have been having recently. Don’t forget to be generous of deed and spirit and word at some point in the coming week. It will make a difference to somebody. Art of the past week……..
« You can have any colour paint you want as long as it’s brown……..